Product information "Barathea Braces - Navy / Burgundy / Green / Yellow"
Barathea braces in a classic repp pattern. 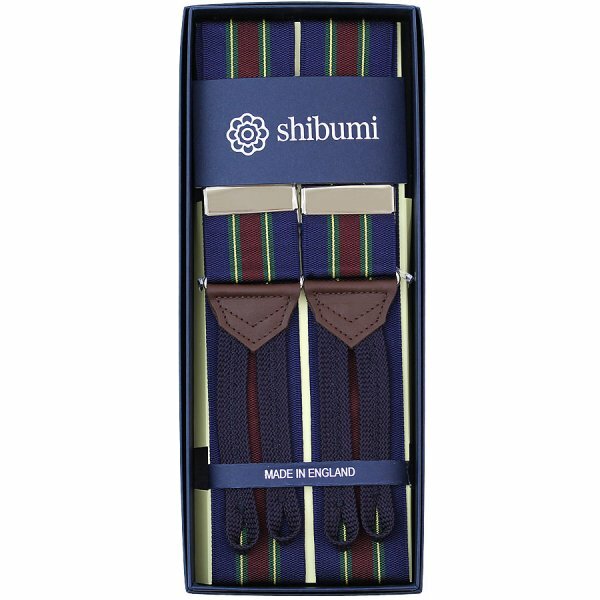 The navy ground and wide bordeaux stripe are eas to pick up in other parts of the outfit like the tie or pocket square. The small green and yellow stripes nicely break up the darker colors of the stripe. Add a green donegal jacket, OCBD, creme flannel pants and chukkas: voilà. Related links to "Barathea Braces - Navy / Burgundy / Green / Yellow"